The Divine Living Space Blog: ORC: Week 2 - Finishing our Multipurpose Space! It's week two of the One Room Challenge and we have been busy around here! The carpet was installed and we LOVE it! It really warms up the space and adds a little texture to the room. I plan on doing a group of staggered pallets on the back wall. My brother in law pulled all the pallets apart, my son power washed them, and I scrubbed the debris and yuck off with a brush. 4. //I have a couple surprise elements up my sleeve. I can't give it all away now, so you'll have to come back and see what I'm up to! Like I mentioned in my previous post, I am working on completing the staircase that leads up to this room. NOT a small undertaking. The thirteen treads have been sanded and stained. Twice. My plan is to start Poly'ing, and moving onto painting the handrail. Thanks for all the encouraging emails. I post lots of sneak peeks on Instagram. Head over there and follow along! 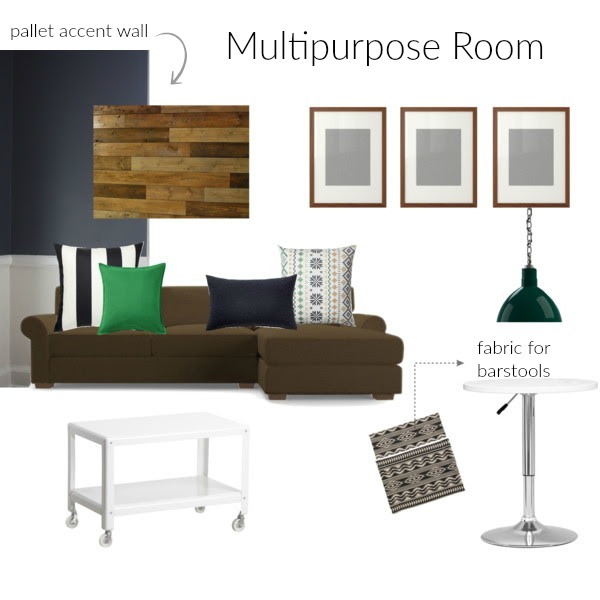 Be sure to check out the rest of the One Room Challenge Participants Here at Calling it Home! This room is looking so great!! Love how your dark walls came out, and the direction you are going with some warm wood and fun pillows. Can't wait to see more. Thanks so much Lisa! I am loving your room as well! Etsy is my go-to for affordable art. There are so many digital downloads you can get printed in multiple sizes. Look the look and feel of this room. I'm chuckling a little because we have the almost identical carpet in our basement and our plans are very similar. We must have good taste!!! Ooh, I like the wall color with the couch, I know it's not your favorite but good choice to keep it and work with it! Wow, I love that carpet! The pallets usually steal the show :-). Good luck! Wow - you are really moving right along! Love the dark walls - I have them in our office and they're definitely a favorite in our house. Can't wait to see your accent wall!